My Northern Hemisphere concept of the harbinger of winter has changed along with the latitude I now call home. We have Christmas Palms starting to bear red berries and many plants coming into bloom as the seasons change. A sled pulled by a team of flamingos has appeared on a front lawn up the street and the flamingos are wearing red capes! I laugh everytime I see this bit of holiday yard art. Hong Kong Orchid (Bauhinia) trees start to flower in December and I spied my first one this morning while walking my hounds. The first one was white and as I walked back into my driveway, I noticed my neighbors purple one had just started to flower as well. In the next month or so this tree will be covered in what appears to be purple butterflies. This is a Tabebuia in the parking lot of my grocery store. To me, Tabebuias are the Forsythias of spring in South Florida. Bright, cheerful yellow flowers on a semi gnarly trunked tree with corky bark. This tree will soon be covered in yellow trumpets. Tropic Florida, to the best of my knowledge is a term coined by Frederic Stresau to describe South Florida, he is a fellow Landscape Architect who wrote the book on Florida. The book is unfortunately titled Florida, My Eden, making it sound more like romance than shrubbery. Mr. Stresau has been gone for many years and I think his book could use a little updating and really a new title. On the left, we have a Rose Apple, Syzgium jambos, a rather weird fruit common in the Caribbean, it has a rose scent with a slightly sweet taste and the texture of a water chestnut. We keep meaning to make a pie from the fruit. On the right is a Mango in bloom, I think this is a Haden Mango, nice fruit for eating or baking a Mango Rum Cake. I have had fruit from this particular tree and it is highly recommended. On the left, Shell Ginger, Alpinia zerumbet, a true sign of Spring peeking out from its foliage and to the right flowers from the Hong Kong Orchid tree. I have cut these for flower arrangements these past couple of weeks. I am trying to get everything in place for the hot summer weather and feel time slipping away for working outside. My tomatoes have set fruit and I think the Armadillos ate it! Tomato season really ends about Memorial Day here, although it can be pushed to July 4th. I have seen people use umbrellas over tomato plants to extend the season. Time for me to get back to the garden. Last week I posted about spring flowering trees in Tropic Florida. One was a new plant to me, White Geiger or Cordia, the other is a Geiger Tree which I have encountered fairly frequently. Both trees belong to the Genus, Cordia. This is the Geiger Tree, named shockingly for a guy named Geiger, who was a prominent Conch (resident of Key West) in the 1800’s. 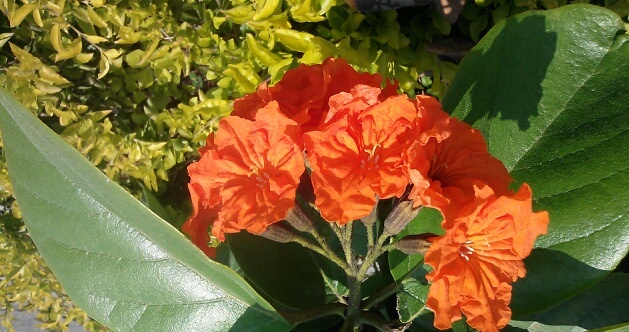 The botanical name is Cordia sebestena. These are reported to grow to 25′ tall, I have yet to see one that size. This may be due to a fairly recent availability in the nursery trade. These trees are native to South Florida and the Caribbean. I see them flowering off and on during the year – the floral display seems more prolific in the spring. The tree always seems a bit gangly to me, but the flower certainly gives an orange burst of tropical vibe to the surroundings. 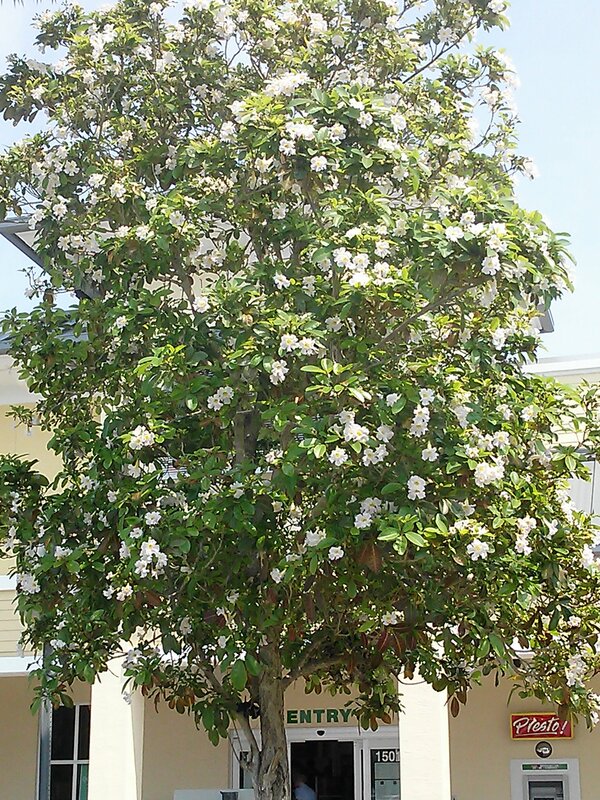 In my opinion, the White Geiger Tree or Cordia (also called Texas Wild Olive, for reasons unknown to me) is a more attractive tree with a more formal shape. The botanical name being Cordia boissieri, this tree is native to the Rio Grande Valley and South Texas. 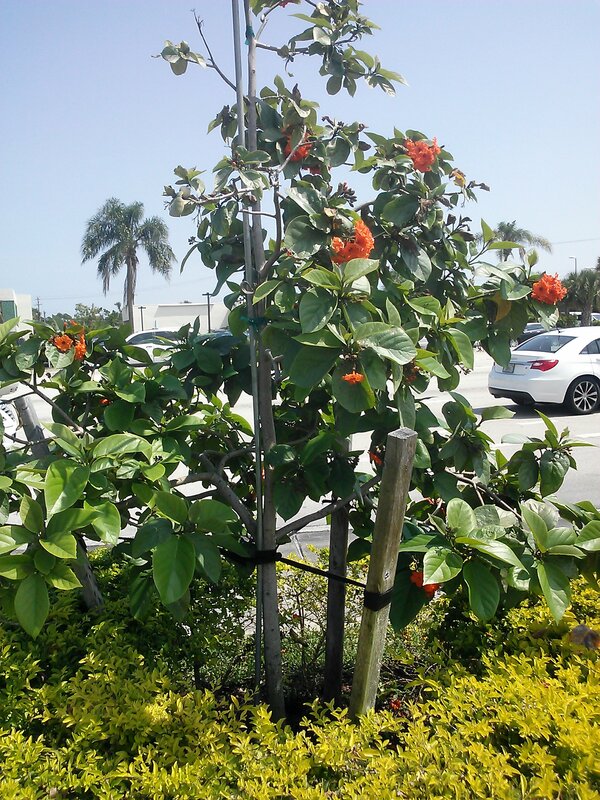 Reportedly more cold hardy but still evergreen and about 25 feet tall, White Cordias are not very popular yet in South Florida. I think they will be. I have sourced a local grower with one of these in stock. It is just a matter of time before a White Geiger Tree appears in my garden.